Arbor-Nomics® > Blog > Atlanta Lawns > Are Fall Webworms a Concern? Are Fall Webworms a Concern? What are those webs that encase groups of leaves on your trees this time of year? The work of fall webworms, of course. These autumn pests can be an unsightly addition to your Atlanta landscape as they munch on leaves and expand their nests across your foliage. Fortunately, they don’t typically cause permanent damage to your plants, but there are treatment options if you wish to eliminate these obnoxious caterpillars. Fall webworms belong to the caterpillar family and can vary in appearance. They all, however, have fine hairs covering their bodies and measure in at about one inch. These pests feed on the fresh foliage of hardwood trees while simultaneously spinning whitish-grapy silk webs around the leaves. They take haven in cherry trees, crabapples, oaks and other trees starting in July and often inhabit your landscape until the leaves fall or the caterpillar stage of life ends, sometime between September and November. Once they complete the caterpillar phase, they drop out of the trees as larvae before they become brown moths in the spring. While they don’t usually cause long-term damage, they do defoliate sections of trees. Depending on the number of webs and the duration of the infestation, they could weaken an otherwise healthy plant. Maybe you’ve got quite an infestation taking over your landscape and causing noticeable damage, or perhaps you just can’t stand the sight of these nuisances any longer. Either way, you have options. If you want to go the DIY route, you can break up the webs with a pole to expose the caterpillars to the elements. The webworms can re-encase themselves, but birds and parasitic wasps will gladly enjoy a feast in the meantime. 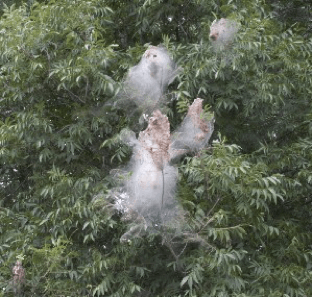 If DIY is not your style, or if you want the assurance of a more comprehensive approach, we’re happy to disturb the nests and apply a contact insecticide to remove the webworms from your trees. Simply call us or request a service call online. Fall webworms appear more threatening than they typically are, but that’s not to say they should always be ignored. If you have a few here and there, that’s normal, and they shouldn’t be a serious problem if you let them be. However, if you notice that they’re defoliating evergreens which won’t lose their leaves or causing any other extensive damage, we’re here to help stop them in their tracks.